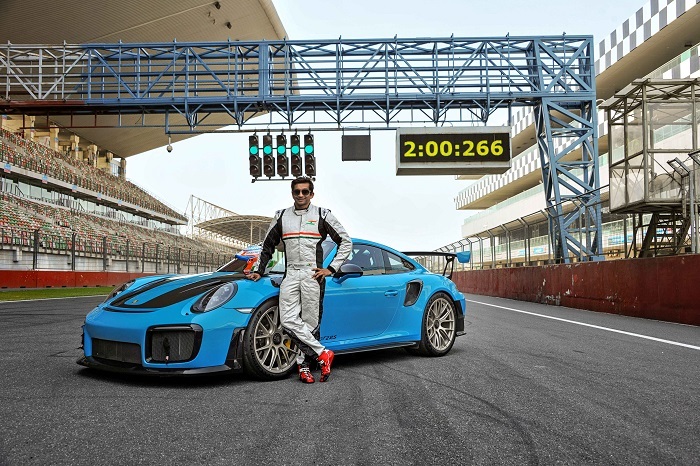 20 March 2019, New Delhi, Delhi, IndiaOrganised by Porsche India, Narain Karthikeyan set a new lap record for street-legal cars at the Buddh International Circuit. India’s first ever F1 driver, beat his own fastest lap time when he claimed the honour in a 911 GT3 on the track last year November. Yesterday, Narain went even faster in a Porsche 911 GT2 RS, taking the racer just 2 minutes 00.266 seconds to complete the 5.14km of India’s only FIA certified track. Organised by Porsche India, Narain Karthikeyan set a new lap record for street-legal cars at the Buddh International Circuit. India’s first ever F1 driver beat his own fastest lap time when he claimed the honour in a 911 GT3 on the track last year November. Yesterday, Narain went even faster in a Porsche 911 GT2 RS, taking the racer just 2 minutes 00.266 seconds to complete the 5.14km of India’s only FIA certified track.